To slide (show/hide) PickerUI, you only have to use slide() method, selecting none (by default, center) or some position. In order to receive the value selected in the picker, you will need to implement the onItemClickPickerUI interface. 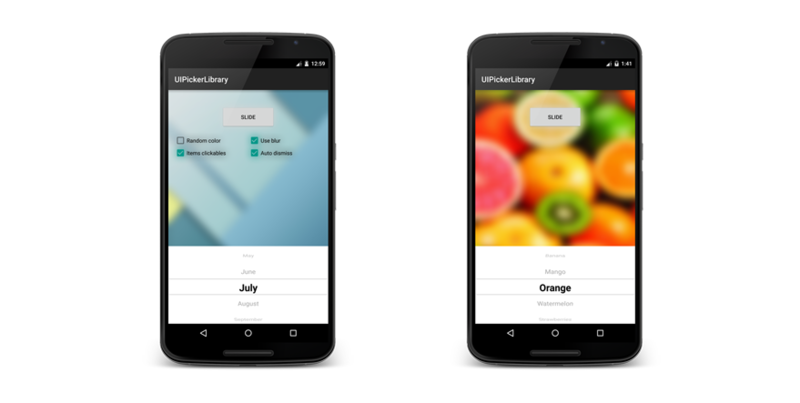 This library applies a blur effect when you slide the picker, but it is optional and optimized. You can choose Java algorithm (slower) or RenderScript (a quick and efficient solution to blur images). Available since API 11 (Honeycomb), RenderScript allows to take advantage of the GPU acceleration and is targeted at high-performance 3D rendering and compute operations. Does your app use AutoLabelUI? If you want to be featured on this list drop me a line.